The biggest problem of all: most people don't know the ocean is in trouble. The One World One Ocean Campaign is using the power of film, television and new media to inspire people to protect and restore the health of the ocean. One World One Ocean is a new organization dedicated to saving our oceans through increasing marine protection areas, changing the way people think about seafood, and reducing the use of plastics. I just joined One World One Ocean's campaign to protect our oceans, and the life within. only 1% of our oceans are protected, compared to 12% of our land. 90% of the world's large fish are gone. the global catch of fish and shellfish in 2010 was 92 million tons. That's equal to 252 Empire State Buildings! None of this is sustainable, and now we can do something about it. Renowned oceanographer and National Geographic explorer-in-residence Sylvia Earle discusses the threats facing our oceans. Harold Hackett, 58, from Tignish displays some of the bottles with messages inside that are ready to be set adrift, and letters from some of the 3,100 people who have found his notes. Harold Hackett's network of bottle-tracking associates stretches all around the Atlantic Ocean. So when he was advised recently of an Icelandic newspaper reporting on one of his bottles being found on the shore way up there he was not surprised. He was already aware of four other bottles washing up on Iceland's beaches. Bottles with messages from Harold Hackett, 58, from Tignish, have made it to France, Germany, the United States, even Africa. Since launching his message-in-a-bottle hobby in 1996, Hackett has set 4,871 bottles adrift. The note inside asks finders to write back to him, telling when and where they found his bottle, and to include the launch date as written on his note. So far he has received over 3,100 responses, a 63.6 per cent response rate. "I got one (note) back with five different people finding it. They found it and let it go. It started in Cape Breton, went to Nova Scotia. It went to Newfoundland and then it went to St. Pierre-Miquelon and Florida, and then he wrote back to me," he said. "There were five letters in my letter when I got it." A few bottles were chain-mailed two or three times. Hackett cast a glass Pepsi bottle with a note inside overboard while fishing tuna off North Cape in 1995. "I just wrote on it my name and address and said, 'whoever finds this, please write back to me.'" That winter he received a letter from the Magdalen Islands. That was all it took for him to get his hobby going and the following May 250 messages were set adrift. "I used to write all of those out by hand, the first four or five years," he said. "A lot of work writing." Then he started getting his notes photocopied. He'd later enter the launch date with permanent marker. "I still have a lot of writing," he said, explaining that he writes back to everyone who contacts him with information on a found bottle. "Harold the bottle man" has become somewhat of a legend. He even has a display at Ripley's in Cavendish. That happened after the Ripley's owner found one of Hackett's bottles at his cottage in Florida. Some of the letters and souvenirs he received are included in the display. Someone from eastern P.E.I. got in trouble with environment after letting 1,000 bottles go one night. They were all on the shore the next morning. "He didn't know that the wind has to be west when you let them out." Local fishermen are accustomed to seeing his bottles with neon paper and reflector tape bobbing in the water. "The minute they see it, they don't even have to look at it. They just say, 'that's Harold Hackett,' and they throw it back over." Despite all the bottles he's heard back on, there's one bottle that still eludes him, bottle Number 1 from 1996. I've got a feeling this year (will be the one)," he said. Of course, there's the possibility it has been found but isn't legible. The first few notes he dispatched were written with pen and the ink would have faded. He has been using permanent marker ever since. One of his most productive years was 2007 when 575 responses were received. "Every bottle has its own story." Usually let a lot go on his birthday, Aug. 23 as well as on his father's birthday and his late mother's birthday. Most are released from North Cape and some have been dispatched while out on fishing trips. He recently got two responses from Newfoundland where letters arrived 12 and 13 years after being let go on sea ice. "Waiting for the letters, to read them, and writing back," he said, gives him satisfaction. He includes a photo of himself in every reply. Sometimes he puts inexpensive souvenirs in his bottles. Some respondents send him souvenirs and photos from their communities. BGU researchers have today that they have discovered deep springs on the floor of the Dead Sea, which provide fresh water to the rapidly dwindling lake. Meanwhile, a parallel study by German researchers has found new forms of life growing around the fissures in the sea floor. The Dead Sea is shrinking as the water level drops at an alarming rate -- about a meter a year. Israeli and German scientists have been researching groundwater springs which discharge from the sea floor to understand the impact of this process on this unique ecosystem. While the existence of springs has been known for decades as people observed ripples on the surface, the scientists have discovered deep springs not visible from shore. The Dead Sea lies between Jordan, Israel and the Palestinian West Bank. Its salt-heavy waters allow humans to float effortlessly on the surface — a phenomenon that makes the Dead Sea a popular resort destination, yet notoriously challenging for divers attempting to swim down into the water. The freshwater gushes from steep-walled craters about 45 feet (15 meters) across and 60 feet (20 meters) deep. The researchers found that the water forms a complex of springs flowing along the seafloor that is hundreds of feet long and 90 feet (30 meters) deep in some places. In addition, the divers found mats of microbes living near the holes in the seafloor. The variety of the microorganisms living in an environment thought to be largely devoid of life was surprising, the researchers said. The Dead Sea is rapidly disappearing. Its waters evaporate at a rate of roughly 3 feet (1 meter) per year, largely due to humans choking off its main source, the Jordan River, to use for drinking water, according to the researchers. The Dead Sea is the lowest point on Earth at 418 meters below sea level, and also one of the saltiest bodies of water on Earth with a salinity of about 300 parts-per-thousand (nine times greater than ocean salinity). It is located on the border between Jordan and Israel, and is fed by the Jordan River. Of 32 survivors who managed to clamber onto lifeboats, Second Officer Richard Ayres was the only one who, 13 days later, made it to the Cornish coast alive. He was awarded an MBE for his attempts to rescue his fellow sailors and lived until 1992. The wreck of the 412ft-long Gairsoppa, owned by the British Indian Steam Navigation Company, was discovered by Odyssey Marine Exploration, an American underwater archaeology and salvage firm, this month. The Department of Transport had awarded the Florida-based treasure hunters a contract to conduct the search, allowing the company to retain 80 per cent of the profits of any silver salvaged. Greg Stemm, chief executive of Odyssey, said: "We were fortunate to find the shipwreck sitting upright, with the holds open and easily accessible. "This should enable to us to unload cargo through the hatches, as would happen with a ship alongside a cargo terminal." The SS Gairsoppa lies approximately 3 miles below the surface of the north Atlantic Ocean. The ship sank after being hit with a torpedo on February 17, 1941. Odyssey discovered the shipwreck in 2011 and inspected the site with a remotely operated vehicle (ROV). What appear to be tea chests were observed in one cargo hold that was accessible to the ROV. The Gairsoppa's cargo manifest included more than 1700 tons of tea and up to 7 million ounces of silver. Odyssey's tethered robot took three and a half hours to descend 2.9 miles to the seabed. There, it found a gaping hole where the torpedo had struck 70 years ago. The company said it had confirmed the shipwreck's identity from evidence including the number of holds, the anchor type, the scupper locations and red-and-black hull colours. Although none of the precious metal has yet been found, the shiny tin linings of the tea chests were initially mistaken for silver bars, according to the New York Times. The Odyssey team is expected to begin the "recovery" stage of the operation when the weather improves in spring. Mr Stemm said: "While some people might wonder about the potential complexity of salvage at this depth, we have already conducted a thorough analysis of the best tools and techniques to conduct this operation and are confident that the salvage will be conducted efficiently and on a timely basis. "Hundreds of modern cargo ships like this have been salvaged since the mid-20th century, some at depths of thousands of metres. "We were fortunate to find the shipwreck sitting upright, with the holds open and easily accessible. This should enable us to unload cargo through the hatches as would happen with a floating ship alongside a cargo terminal." "By analysing the known configuration and research about the Gairsoppa and her final voyage and painstakingly exploring the shipwreck site to record each element and item, our team of experts was able to positively identify the site as the Gairsoppa. "Even though records indicate that the lifeboats were launched before the ship sank, sadly most of her crew did not survive the long journey to shore. By finding this shipwreck, and telling the story of its loss, we pay tribute to the brave merchant sailors who lost their lives." The precise value of the ship's treasure is unclear because the wartime government did not disclose the true nature of its transportation records. But Odyssey discovered that it had paid out an insurance claim on silver amounting to around 120 tons owned by private parties and it believes the government's hidden share would be about the same. A federal appeals court in Florida this month upheld a ruling that Odyssey must hand over an estimated £250 million worth of gold and silver coins to the Spanish Government after a four-year legal battle in which it was accused of plundering Spain's national heritage. The coins had been recovered from a Spanish frigate laden with bullion from the Americas that was sunk by the British off the coast of Portugal in October 1804. Rockall may seem tiny, but most of its mass lies hidden below the waves. It Is one of the most desolate and disputed pinnacles of rock in the world. Lashed by huge waves, besieged by seabirds and dirty white with guano, Rockall pokes its tiny head above the Atlantic, 228 miles west of North Uist. Now, 200 years after the first recorded landing on the rocky islet, it is starting to reveal its hidden depths. 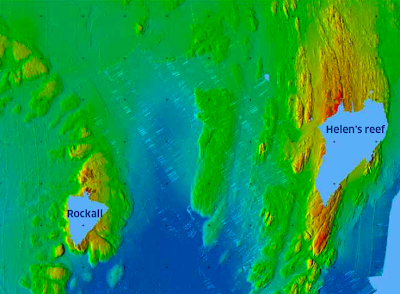 For the first time, Scottish scientists have mapped the sweeping underwater mountain ranges of which Rockall forms the visible peak. Rockall is just 31 metres long, 25 metres wide and 21 metres high – but it is the tip of the highest mountain on a vast continent lying under the Atlantic Ocean. The researchers have discovered a series of “spectacular” ridges, reefs and crevasses fanning out across the seabed. And they have found huge conga eels lurking in the rocks, along with ling and tusk fish. Although Rockall is best known today for featuring on Radio 4’s shipping Forecast, it was on September 8, 1811, that Royal Navy officer Basil Hall first set precarious foot on the tiny crag and climbed its 19-metre summit. Since then it has been at the centre of a series of international arguments over which country it actually belongs to. Ireland, Iceland and Denmark have all staked their claims. Its ownership – and the valuable fishing and mineral rights that could go with it – is currently under investigation by the United Nations. For the moment, however, Rockall is one of the British Isles and the westernmost part of Scotland, and scientists from Marine Scotland and Scottish Natural Heritage have been trying to learn more about it. In July, they took the marine patrol vessel, Scotia, on an expedition to the area, equipped with a multibeam echo-sounder, underwater video cameras and specialist fish traps. The result, unveiled today, is a brightly coloured, high-resolution map of the seabed around Rockall and its sometimes-submerged neighbour, Helen’s Reef. According to the scientists, the map shows that the two rocks are only the summits of vast continents hidden under the sea. “What emerged was truly spectacular,” they claimed. Francis Neat, chief scientist in Marine Scotland’s Rockall survey team, said ferocious weather had prevented previous surveys, but this year the sea was calm and they were able to collect “excellent” data. Neat said squid were caught in the deep trench between Rockall and Helen’s Reef, and well as other fish in the surrounding seas. “By using fish traps we also discovered the reef is inhabited by huge conger eels, ling and tusk,” he added. Until now there were no detailed maps of the shallow waters around Rockall, which rises 2000 metres from the deep ocean plains. “It’s fantastic that Scotland has reaffirmed our possession of Rockall through this survey. Salinity changes are linked to the cycling of freshwater around the planet and influence ocean circulation. Nasa has released the first global map of ocean surface salinity acquired by the Aquarius/SAC-D satellite, which was launched in June this year. Knowing the saltiness of seawater will improve scientists' understanding of some key climatic processes. Variations in salinity help drive ocean circulation and their measurement can also reveal how freshwater is moving around the planet. The mission is a joint venture with the space agency of Argentina (Conae). The new map incorporates just the first two-and-a-half weeks of data since Aquarius became operational on 25 August. Red and yellow colours denote areas of higher salinity; blues and purples represent areas of lower salinity. Areas coloured black represent gaps in the data. The map picks up well-established, large-scale features such as the differences in salinity between the Atlantic, Pacific and Indian oceans. Also apparent are the areas of lower salinity associated with rain belts near the equator, and the higher values associated with evaporation in the subtropics. You can also see smaller features such as the freshwater outflow from the Amazon River, which tends to dilute the immediate surface waters of the Atlantic. Ocean salinity is measured in parts per thousand (grams of salt per kilogram of sea water). The observed range is a small one - generally between about 32 and 37 parts per thousand out over the open seas. The goal of the Aquarius mission is to retrieve salinity with a resolution of 0.2 parts per thousand. That is a concentration change equivalent to about one millilitre of salt in six litres of water. Scientists have been able to measure ocean salinity for decades by lowering instruments from ships or by deploying robotic floats, but the technology to gather data from orbit is a recent innovation. Aquarius carries three high-precision radio receivers that will record the natural microwave emissions coming up off the water's surface. These emissions vary with the electrical conductivity of the water - a property directly related to how much dissolved salt it is carrying. The Nasa-Conae spacecraft is not the first ocean salinity mission in orbit. Europe already has a satellite in operation called Smos. This was launched in 2009, and produced the first-ever global maps of salinity built from space data. The intention is to inter-calibrate and combine the Aquarius and Smos measurements. Together, these spacecraft are now acquiring volumes of salinity data that dwarf all the information ever gathered in this field of study.